Three years ago, I was a pregnant Client Reporting Representative working a 9-to-5 office job at a local collection agency. I knew that I needed to learn how to make a lot of money in order to replace my office job. With growing aspirations of staying home with my unborn son, I began to rough out the plans for my own home-based business. By six weeks postpartum, I decided that I would not be returning to work, and I officially took the plunge to supplement my husband’s income by working from home. Since then, I have built up my business while creating and sharing business strategies with others who desire to find work at home jobs or start a small business. See Also: Ebates Review: How Does Ebates work? Proof of Payment Included! What Type of Home Business Do I Run? How Can You Can You Make Money From Home? What I didn’t know then is that my business idea for supplemental income would grow from $14,000 in the first year, to $41,000 in the second year, to $50,000 in the third year. This was all accomplished with no more than $300 spent on advertising over these three years. After realizing the potential of my business, I already have plans to invest in my business and grow my earnings even more during the next three years. Income is an uncomfortable topic for me. Very few people in my life know how much I actually make, but I have decided to step out of my comfort zone to share my journey in detail so my experiences can encourage others to consider the endless work-at-home possibilities available to them. It takes time, dedication and a lot of faith to start this journey, and the idea of quitting a day job to work from home is certainly not for the faint of heart. But that said, I want to teach you how to make a lot of money so that you too can stay home with your children. I can’t tell you how many times I’ve been asked, “So what do you do for work?” Before answering, I usually glance at the nearest clock and try to assess the questioner’s level of interest. What I do isn’t boring, nor is it incredibly difficult. But explaining my work-from-home business does require a good amount of backstory. So I typically find myself replying to work-from-home questions with, “I do a little bit of everything these days,” or “I keep busy by filling various roles in the e-commerce world.” At that point, questioners either ask for more details or make a dash for the door (usually the latter, somehow understanding that this conversation could take half a day). Don’t worry. I know that while you’re here to find out more about making money from home, you don’t want to spend half a day hearing about it. Unless, of course, it would mean that you would have access to a wealth of information that would enable you to start your own successful home business. While the fact that I have made $105,000 in three years may not sound like a lot of money to the average career woman or man, consider the detail that I – a full-time mom – earned that $105K from a brand-new business that I built from the ground up with a part-time work-from-home schedule. How to make a lot of money. 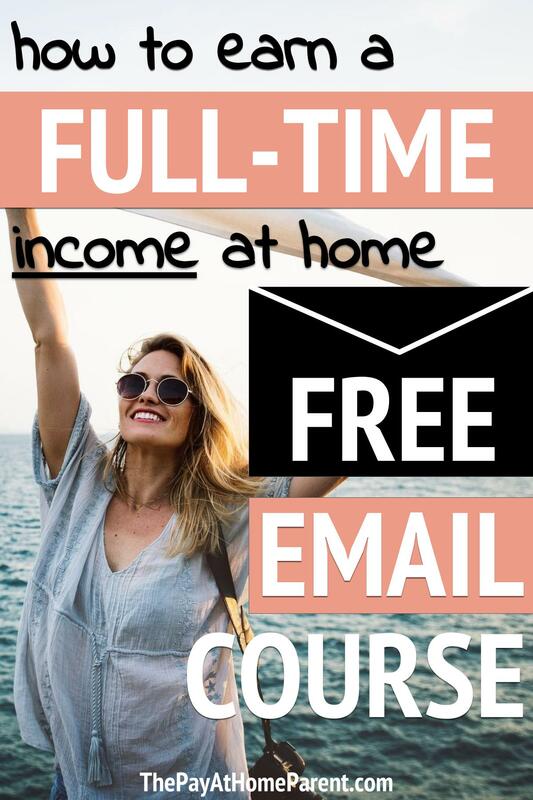 If you can just learn how to make a lot of money from home, then you could ditch your office job. I did just that 3 years ago and I could not be happier! Learn how to make money from home with these 10 simple steps that helped me. So without further ado, here are the 10 steps that helped me grow a successful work-from-home business and make money from home. Take advantage of this work-from-home guide by applying each of these steps to creating your own business plan. If you still need inspiration, here is a list of 100 business ideas that will help you decide where to start. I began this first step with writing and data entry. First, I made a simple list of all of the legitimate work-from-home options that I felt matched my existing skills. My list included an in-home daycare, piano lessons, becoming a virtual assistant, rebranding and drop shipping, and writing services. In my case, writing services turned out to be the best fit for me. Since starting a work-from-home business can be a slow process, I also picked up a few babysitting hours during the first few months. In hindsight, my second step to building my home-based business could have included a few more marketing techniques. But I was also taking care of a newborn baby, so that meant my time was limited. All I needed to do was post a well-written Craigslist ad, and within two weeks, I had landed my first writing client with a decent amount of writing gigs to keep me busy. My main income stream started from blogging and creating fresh web copy. If only I had taken into consideration the revenue that my hundreds of blog posts have earned for various clientele these last three years; I would have started my own blog (The Pay At Home Parent Blog) much sooner! If you are struggling with this very idea, be sure to review my instructions on how to start a blog to make money. I eventually realized that writing was not the only service that I was qualified to offer. I quickly learned Web design and Web user experience testing and began to implement that knowledge with both new and existing clients. One of the most important skills that a business owner can cultivate is the willingness to keep an open mind and learn new things. If you take away just one thing from this, please let it be to be willing to consider new ideas, and to always keep learning. It took me nearly eight months to launch my own website design portfolio (which also detailed my services offered). This step will often be one of the first completed by a new business owner, but I find that it worked best for me to wait. Since I had very little documented professional experience writing and even less familiarity with designing websites, I decided to postpone this step until I had enough experience under my belt to build a website portfolio of my own. I quickly finished as many projects as I could in those first eight months and used them to build a well-rounded portfolio that I still add to today. I will say that I now wish that I had started my own website and/or blog immediately rather than waiting for a fuller portfolio. This is because it can take 6 to 12 months for a blog or website to earn organic (or free) views from people on the web. So take my advice and start your blog or create a website immediately so that you can grow your audience while growing your portfolio! Every fast-growing home business will eventually run into the “bottleneck” effect, where everything slows down because the owner can handle only so much work. About 10 months into my journey, I knew that I was maxing out my part-time schedule and that my income would stop growing if I didn’t put together a team of writers – and soon – to alleviate my daily tasks. It didn’t take long for me to build up a strong team of writers who are still on my payroll. Nearly 90 percent of all of my writing tasks are delegated to my knowledgeable writers (who are all better writers than I!). You can start small by posting little tasks here and see how it grows your business exponentially as you subcontract more and more work. This is an important business component that every organization should at least consider. It took me a full year to finally establish partnerships with my top eCommerce web design platform, small business website platform, and blogging platform of choice. Partners and affiliates are able to fulfill any of your target audience’s needs that you can’t or don’t personally provide. In my case, I migrate websites from old platforms to new ones, providing a new, fresh design, but I do not host websites. Thanks to my growing partner list, I can now continuously service clients in the foreground while bringing in residual income by referring customers to my trusted affiliates in the background. Do yourself a favor and incorporate this important step – and get on top of it sooner than I did! Increase your sales, develop your brand, and generate interest in your business with affiliate marketing. I found that work didn’t flow in at a steady pace during the first year and a half of my home-based business. I took advantage of that spare time to learn new skills so that I could gain more trust – and ultimately more work – from my existing clients. I never tell my customers, “I don’t know how to do that.” I instead say, “I will research that and have an answer for you today!” If you were to read through my client reviews, the common theme in all of them is fast. They know that if they come to me with a request that I don’t have an answer to right away, the turnaround time for me to have it learned and completed will be very short. Each one of your clients wants to feel like they are your only one, especially during those crucial initial interactions. In this age of technology, every business wants to know how to save money by putting something on autopilot. At the end of 2016, a large retail eCommerce business owner asked me if I could automate his various security system quotes. His employees take inbound calls and emails all day and manually create system quotes, but they still have a difficult time keeping up with customer demands. While I had no idea how to fulfill his request at the time, within three days, I had created automation that sent quotes for his first major system directly to his customers’ email addresses all day long. I now quote more than 20 different systems multiple times per day for a total of more than $10 million quoted in 2017 alone. One of my favorite more recent automations is Pinterest. I recently wrote a tutorial on how to setup your own Pinterest scheduler for free. This is a huge time save for me and it costs nothing to use each month! When my quote automation service was brand new, I did not have a way to measure its value and was therefore unsure about how to properly charge my client. Instead of creating the tool and then stepping out of the picture, I took on the opportunity to treat this as an ongoing service and support many of the end customers who are quoted on a daily basis. Instead of paying a one-time fee to use my automated quote tools on their websites, my clients instead pay me a commission in exchange for my knowledge and support time spent with customer calls and emails. If you had asked me two years ago if I could ever picture myself in sales, I would have said, “Never!” Today, I would not have it any other way! During the past three years of working from home, I have reinvested a seemingly low percentage of income back into my business. I have recently found that the more I invest, the more it grows. For many ventures, it is true that you have to spend money to make money. Be aware that many work-from-home scammers want you to believe that you can pay them a little bit of money and almost instantly start to see the cash flow in. That is certainly not a realistic expectation for any legitimate home-based business. Depending on your business idea, you may need only a laptop, a website, and a plan to begin with. But you must be willing to invest even a small amount so that you can see growth in the future. These tried and true steps can be applied to any field – whether you are already making money on the side, or are looking to quit your day job and go all in. They will help you build the home-based business of your dreams and finally ditch the office to work from home. Remember that you set your own limits when it comes to how much you can earn working from home. If you are not willing to put time, research and initial funding into making it work, then a home-based business may not be for you.